The beautiful Burmilla sprang up in the United Kingdom in 1981, as a result of an accidental mating between a Chinchilla Persian male and a Lilac Burmese female. The offspring were so impressive it was decided to proceed with a breeding program. The Burmilla is a cat of Burmese type and temperament but its most impressive feature is the sparkling shaded or tipped coat. The ground colour is pure silver white. The eyes are outlined in a dark colour giving a magnificent contrast and the appearance of a mascara lining. The Burmilla is elegant and of medium foreign type with a muscular body, long sturdy legs and a moderately thick, long tail. The head is a medium wedge, with large ears, a short nose and large expressive eyes. Since the Burmilla carries a recessive long-haired gene from the Chinchilla, long-haired kittens appear from time to time. This long-haired coat however, does not tangle and requires little grooming. 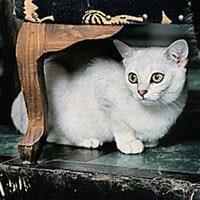 Easy-going and relaxed, the Burmilla makes an affectionate and ideal family pet. It is energetic and loving, making it an excellent companion.